Legacy Building Solutions, a leading designer, manufacturer and installer of tension fabric buildings, has opened a new fabric manufacturing plant at its headquarters in South Haven, Minn. The new facility will allow the company to produce higher quality fabric panels while also increasing capacity. The new plant is a hybrid fabric-steel structure that incorporates steel sheeting on the exterior sides. Offering more clearspan space than Legacy’s previous plant, the new building enables workers to operate more efficiently, particularly when manufacturing larger polyethylene or PVC fabric panels. The set-up allows for greater production capacity and, in turn, faster deliveries of completed tension fabric structures to customers. Featuring a 40-foot skylight and R-30 insulation for increased energy efficiency, the plant is fully climate controlled to eliminate the temperature and humidity fluctuations that can affect the quality of fabric welds. Legacy has also added state-of-the-art equipment — including a laser-guided welding system — to aid in producing fabric panels for larger structures. 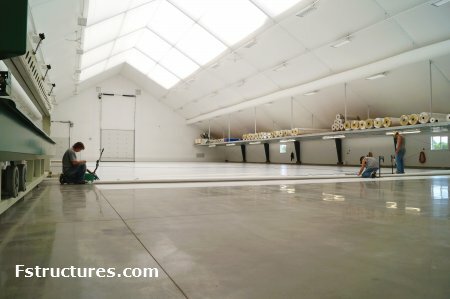 This is especially advantageous when manufacturing panels for fabric buildings with widths of more than 200 feet. 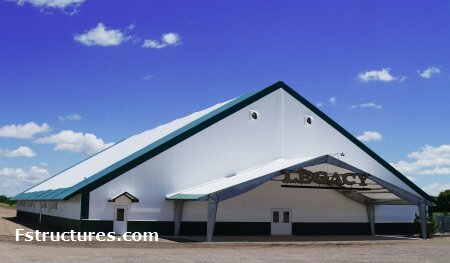 Legacy Building Solutions specializes in the innovative design, engineering and construction of fabric-covered buildings for several different industries and applications. To date, Legacy’s in-house, professional installation crews have constructed more than 30 million square feet of fabric buildings. For more information, contact Legacy Building Solutions, 877-259-1528 or visit the company’s website at www.legacybuildingsolutions.com.